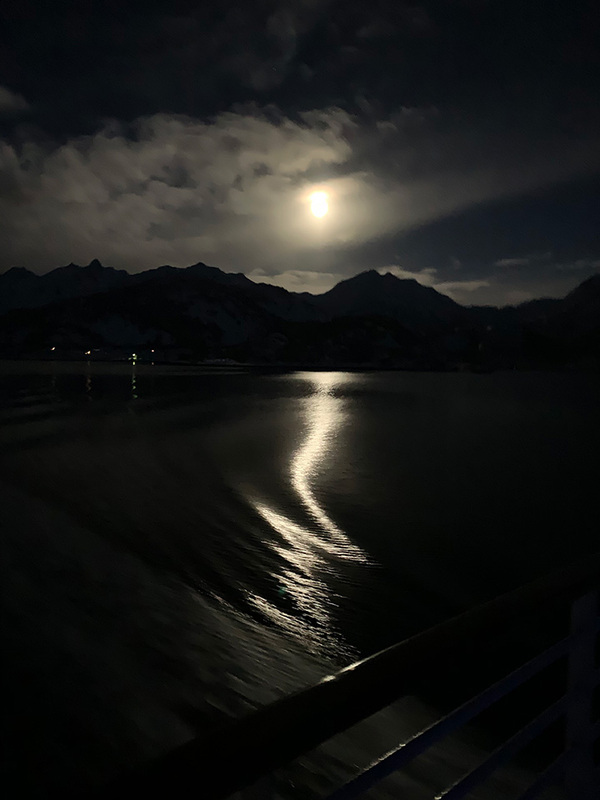 Hurtigruten Diary Day 9: Today we got to enjoy arguably Norway's most spectacular coastal scenery lit by a glorious full moon. As I wrote previously, the southbound return to Bergen is shorter and today it's been really noticeable. That said, it was a very early start and another day of spectacular sights. Unfortunately people are still coughing, and at least one of the crew was off ill today too. It only seems to have spread to one of the people I regularly hang around with, so whether we're just lucky or we're all washing our hands obsessively I'm not really sure! I was in two minds about joining the ‘taste of Vesterålen' bus tour this morning. 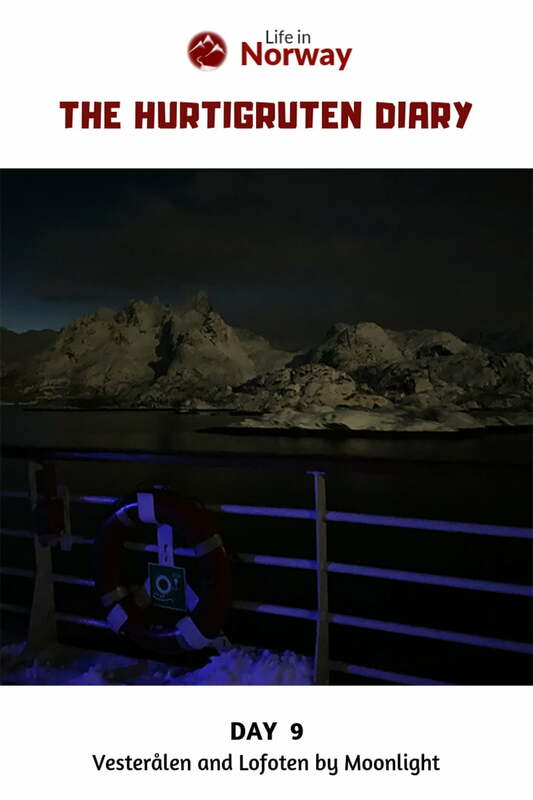 On the one hand it would be 4.5 hours off the ship. As much as I'm enjoying the voyage, walking on dry land is a tempting prospect after nine days at sea! But the bus tour from Harstad to Sortland would skip the port of Risøyhamn, one of the more picturesque stretches of the sea voyage. In the end, dry land won out. 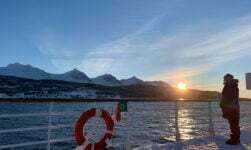 Although billed as a Vesterålen tour, most of the tour actually took place in Troms. 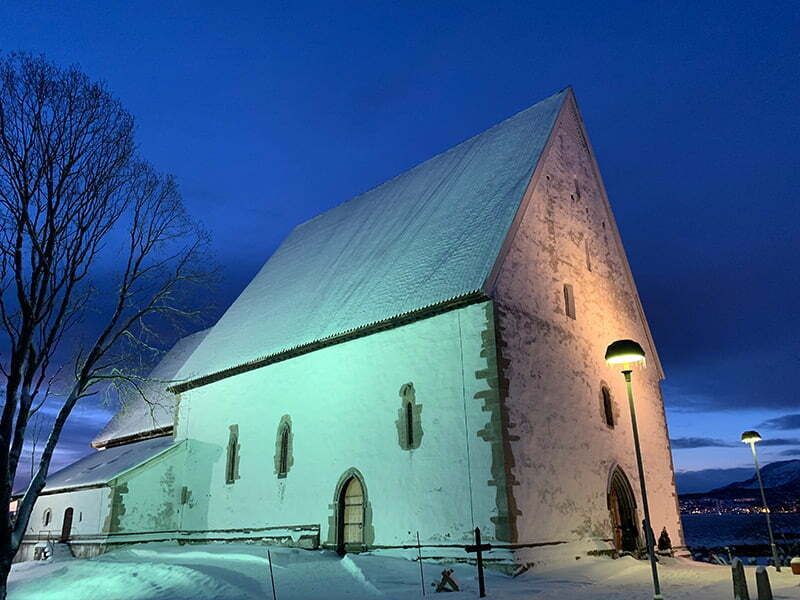 Our first stop was in Harstad itself and the beautiful Trondenes Church. The architecture and location – a stone, fortified church overlooking the bay of Harstad – was hard to beat in the stunning polar light. Inside the adjacent museum was an exhibition on the local area's history that stretches back thousands of years, and the more recent history from World War II. The bus continued onwards towards Vesterålen by way of Kvæfjord (home of Kvæfjordkake!) and the impressive Gullesfjord, one I'd not previously heard of but is now one I'd happily recommend to people. We crossed the fjord on the regular car ferry and had some coffee and bite-size typisk norsk snacks: lefse, and a waffle wedge with brown cheese. 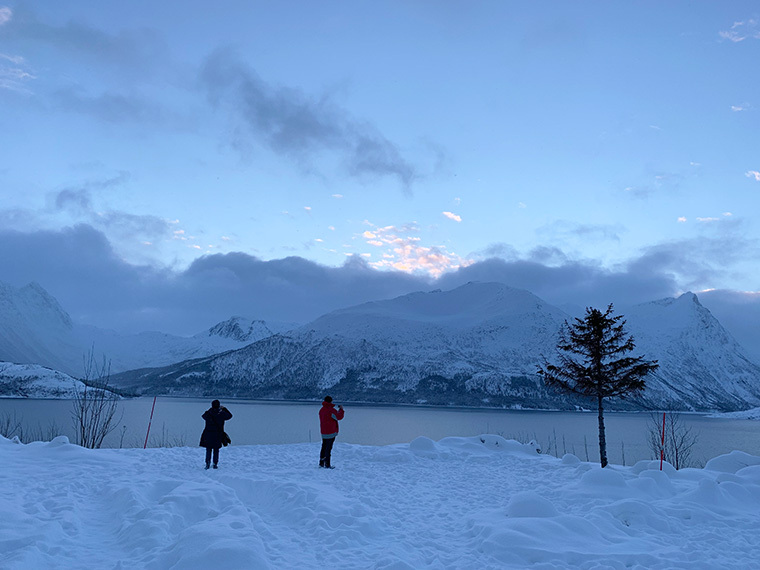 As with the trip to Nordkapp the guide – in this case Berge – was excellent and, very willing to answer any and all questions in Norwegian, English, or German. On arrival at Sortland we had to wait for 10 minutes or so for the slightly delayed MS Vesterålen so we could cross the bridge into Sortland as she was sailing underneath. 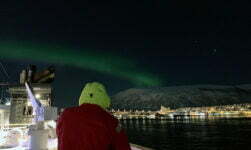 Although it was a slightly surreal experience watching your own ship sail away complete with all your belongings on it, it's a Hurtigruten tradition and was fun to do. I even managed to grab a snap despite being on the wrong side of the bus! 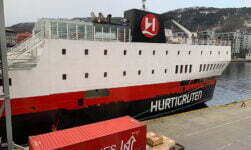 I was looking forward to the hour-long stop in Stokmarknes simply to visit the Hurtigruten museum. 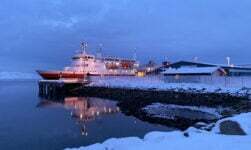 The ship docks just a few minutes walk from the museum, the star attraction of which is the striking retired vessel Finnmarken. Several other passengers were a bit miffed at having to pay 50 kroner entrance to a company they've already paid five figures to for the voyage. They have a point, to be honest, especially as the stay is short. While 50 kroner is essentially nothing in Norway, it is a barrier when people are converting it in their heads to US Dollars, Euro, and British Pounds. Other than the northern lights, I'd been most looking forward to sailing down the narrow Raftsund and by the 100-metre-wide entrance to the Trollfjord. 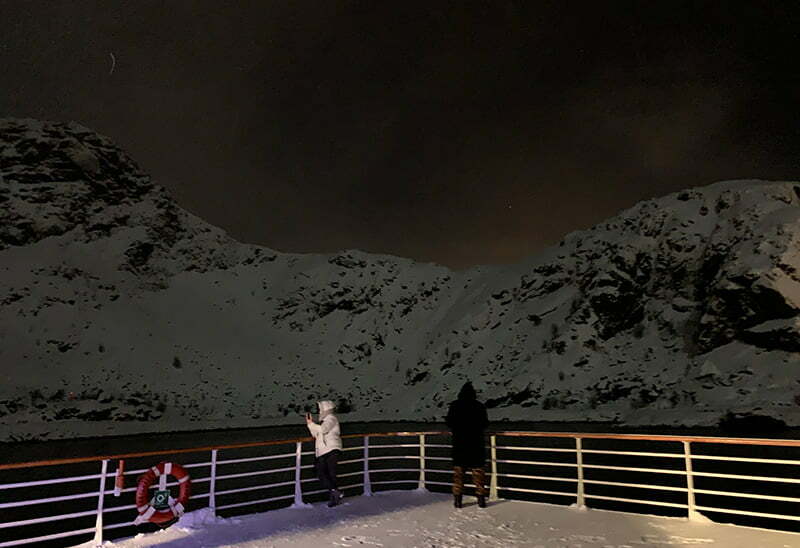 At this time of year the avalanche risk is too great to sail into the fjord itself, but even sailing up to the entrance is a memorable experience. It was a race against time with the diminishing light, but thankfully the intensity of the stunning full moon came to the rescue! 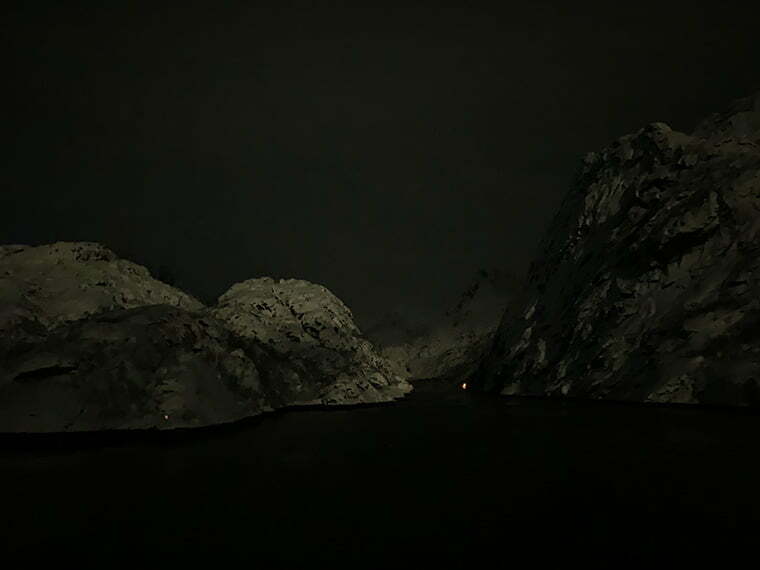 The moonlight also helped enormously with our visit to the entrance to the Trollfjord, providing just enough light on the mountains to create an eerie backdrop that perfectly suited the time of year. The biting wind made taking stable photos a challenge but despite the cold a decent number of people were finally up on deck to enjoy one of the best parts of the coastal voyage. This included quite a few local passengers. 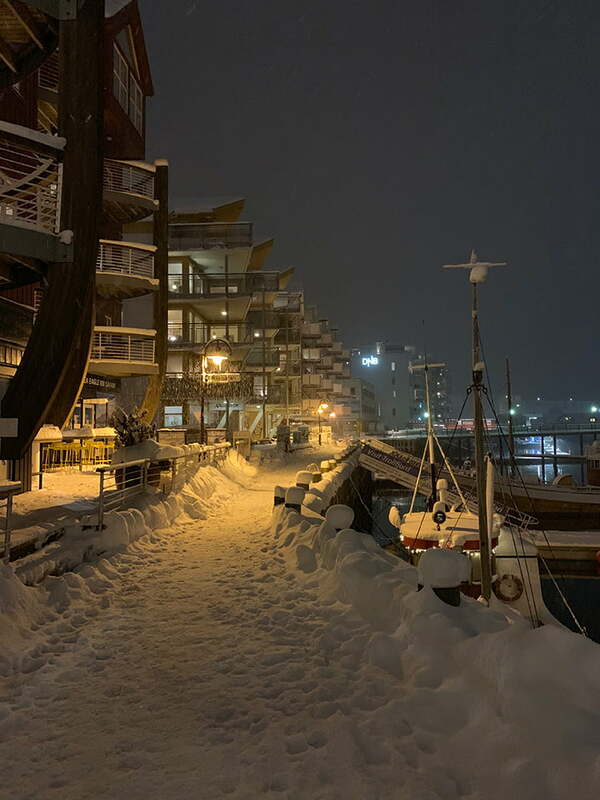 When I eventually turned to the Vesterålen lounge for a well-earned beer, I got chatting to a group of young 20-somethings who had gathered around a table to play a board game. I hadn't seen them before and it turned out they were students travelling from the Tromsø International Film Festival back to Svolvær where they were studying. 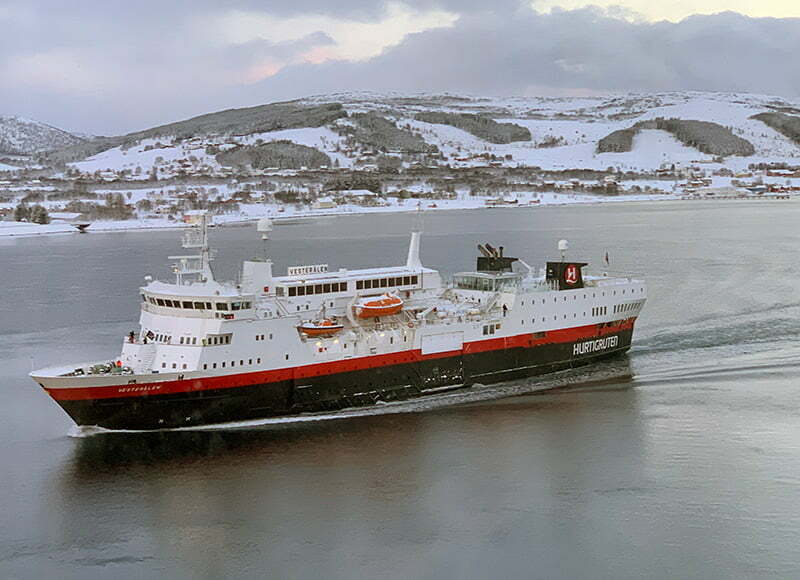 I recorded a brief interview for a future episode of the Life in Norway Show, but the most striking comment they made was that after almost a full day on the MS Vesterålen, they were warming to her after a ‘disappointing' first impression. 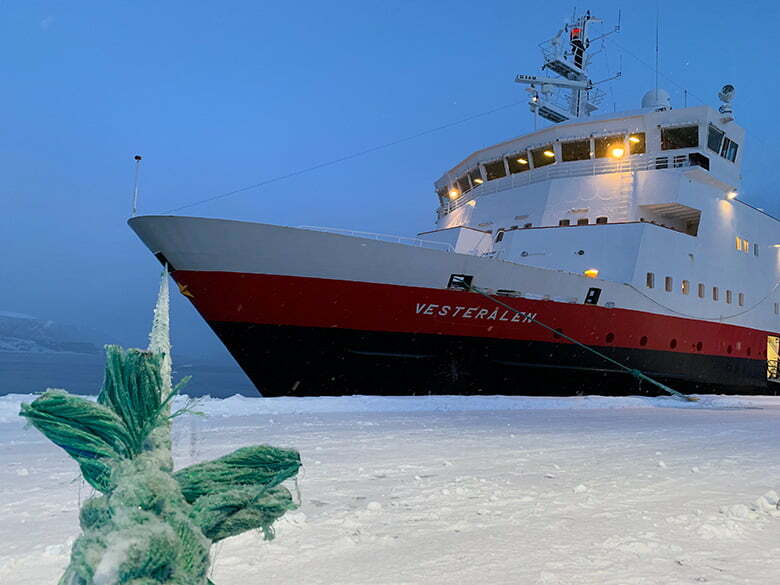 They had made their original journey on one of the newer ships, but said they had enjoyed ‘finding all the quiet cozy spots' on the Vesterålen. 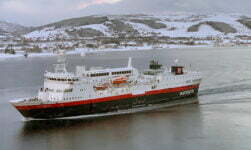 After my brewery visit on the northbound leg, I wasn't planning on returning to shore in Svolvær going southbound. 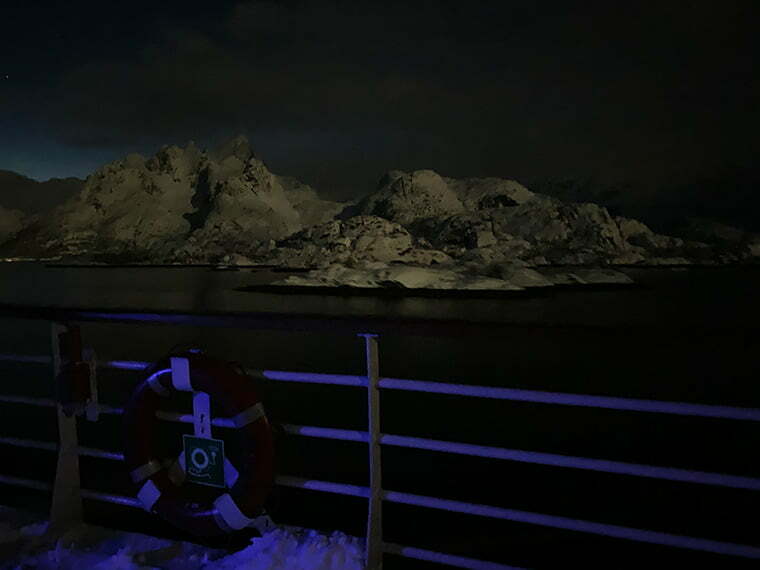 However with a two-hour port call and a blizzard just about to begin, it seemed like a good opportunity to get some more photos. And so it came to pass! 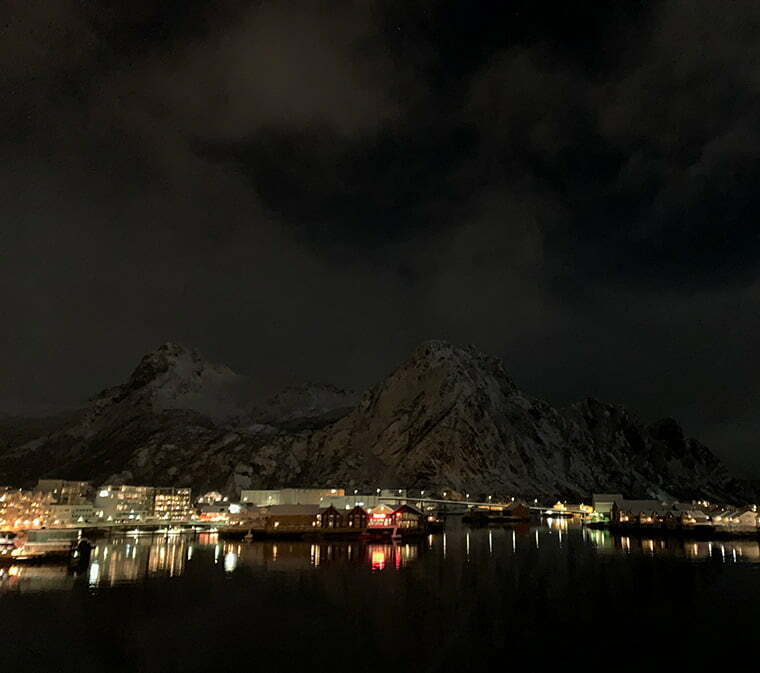 As we left Svolvær there was talk of a rare blood moon that should be visible very early tomorrow morning. Bang goes my plan for a lie-in and a bit of rest tomorrow morning! 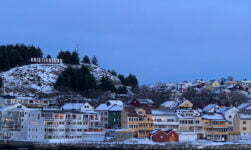 Even though an early night would have made sense, I couldn't resist going up on deck for another look at Stamsund, this time with the added benefit of the full moon. While the video doesn't capture the mountains all that well, it does demonstrate what it's like to be up on a snowy deck at 10.30pm! Despite starting off by saying the southbound journey has been passing by noticeably quicker, I have managed to write one of my longer daily updates! I thoroughly enjoyed today and while I can imagine seeing so much more scenery in the spring, summer or autumn, there has been something very special about the winter light on this voyage. I wanted to take this trip, but realized after following your tour that I can’t do it due to the fact I get very seasick. I was hoping we would be close to the shore the whole time, but based on your reporting the ship is in open, and often choppy water. I know it is a beautiful trip and enjoyed following your journey. I’m taking it in by far the most stormiest month of the year, and there’s only been two days of ‘bad’ stability from a guest perspective. I think if you travel in the late spring, summer, or even early autumn, the chances are a lot less. There really isn’t much “open sea” on the voyage, just maybe four stretches lasting 2 hours or so each.